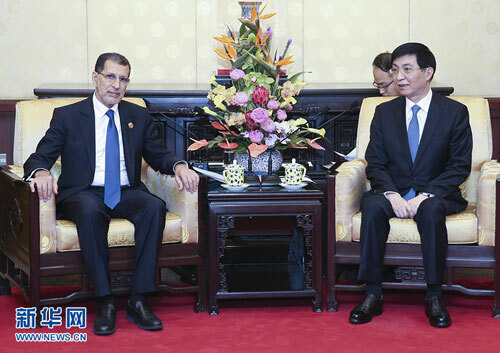 BEIJING, Sept. 4,Senior Communist Party of China (CPC) official Wang Huning on Tuesday met with Moroccan Prime Minister Saad Eddine El Othmani, who is here to attend the 2018 Beijing Summit of the Forum on China-Africa Cooperation (FOCAC) that concluded on Tuesday. Wang, a member of the Standing Committee of the Political Bureau of the CPC Central Committee and a member of the Secretariat of the CPC Central Committee, said the relationship between China and Morocco has entered a period of fast development since the upgrade of the bilateral relations to a strategic partnership in 2016. Wang said China is willing to work with Morocco to implement the consensus reached by the two heads of state, consolidate political mutual trust, and expand cooperation to further promote bilateral relations. El Othmani said Morocco highly values its relationship with China, and is willing to strengthen exchanges and cooperation with China in various fields to elevate the bilateral ties to a new level.